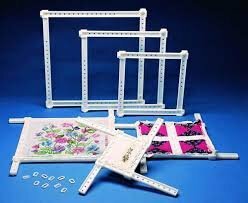 Needlework stretchers in 9", 12", 16", 20" . This frame holds your project stretched evenly and will lot loosen until you remove it from the frame. Each frame adjusts by one inch increments up to the size noted on the package.